Testing, testing, can I get pictures to work now? So, I know, I completely didn’t post last week. I tried to, but the internet here refused to let me upload pictures, so I left it, and completely forgot to try again later. Oops! 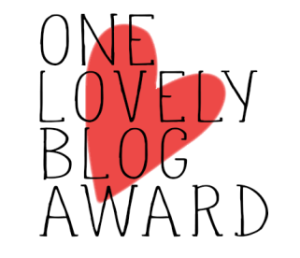 So I scrapped that post, and then wrote this one. Let’s see if pictures work now! So, remember the last time we met, I kinda gave up on the idea of knitting both the mittens for my dad (he loves the idea, which is great 🙂 )? Well, it turns out that that was a good idea, as even the larger size was too small! So I now have to knit another pair of mittens, this time with some more stitches and rows of ribbing. Which is great and everything, as it’ll mean he has a pair of handknit mittens which he’ll actually wear! But I’ve massively had enough of that patten and yarn right now! So what I’m thinking is to give myself a bit of a break, work on what I want to, and then maybe in the beginning of July start the pair properly. And hopefully by them figure out what to do for everyone for Christmas! 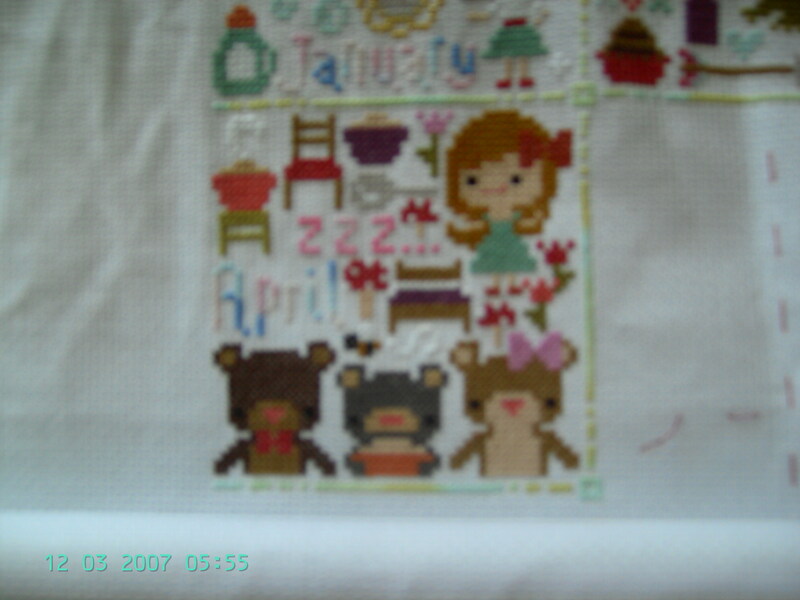 I have managed to finish my other housemates card, as well. This was giving me kittens, for some bizarre reason, as she isn’t leaving till the end of July! 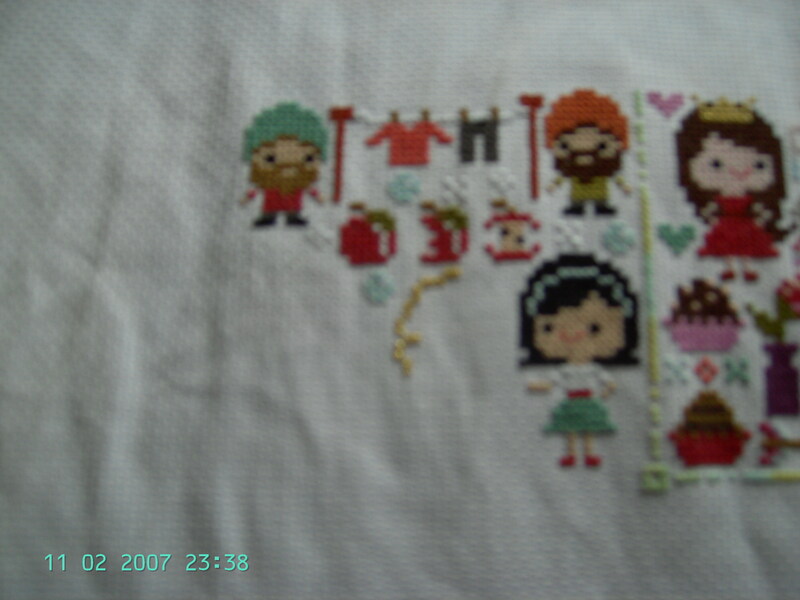 But I am now glad that it’s done, even though it was lovely to stitch. 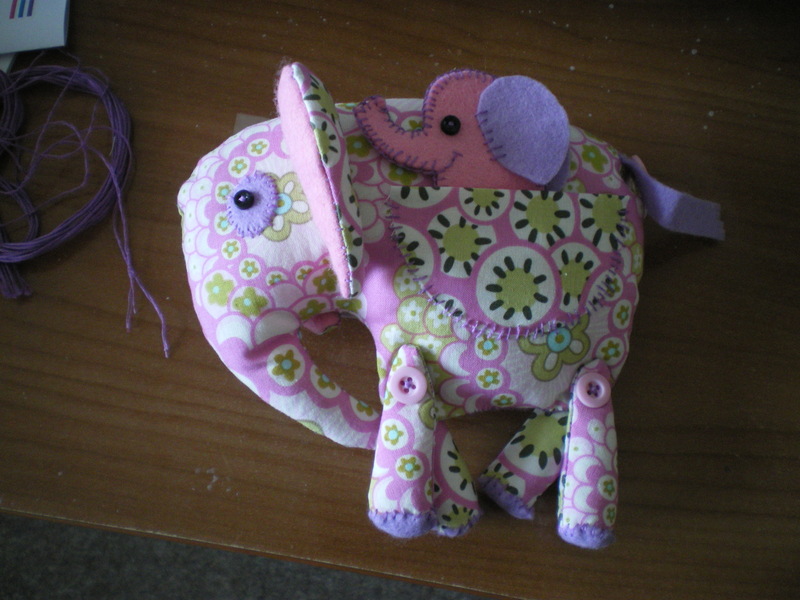 My aunts birthday is the last one I’m making anything for, and so I decided to carry on the elephant scheme! This is Suzie, the elephant-kangaroo hybrid, and Nelly(well, one of them had to be Nelly!) her finger puppet daughter! I think that they are utterly cute and adorable, even though Suzie’s legs were really awkward to stitch- my advice? Just go for it! 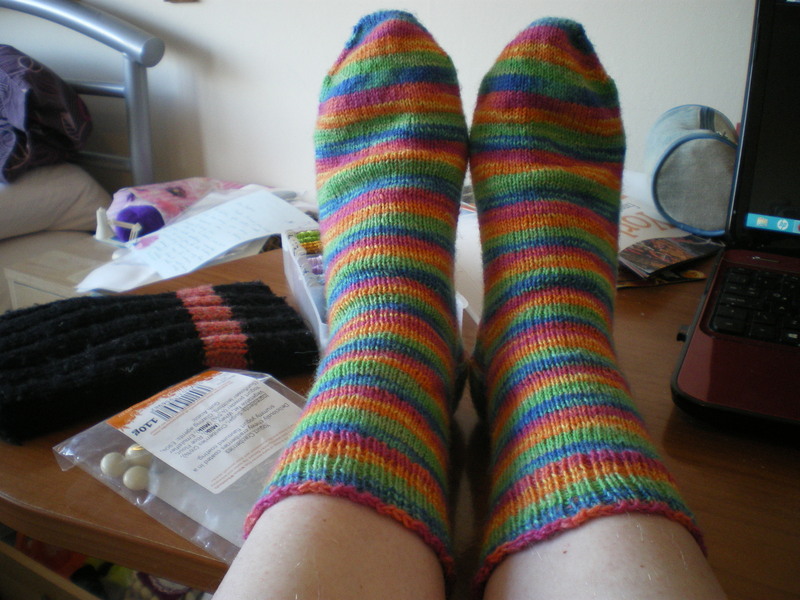 I have also been doing some knitting- I finished another pair of socks! Yay! I now have 8 pairs with (you guessed it!) another one on the needles! I did these two at a time, as I wanted them to completely match! Pretty successful plan, even if I do say so myself! 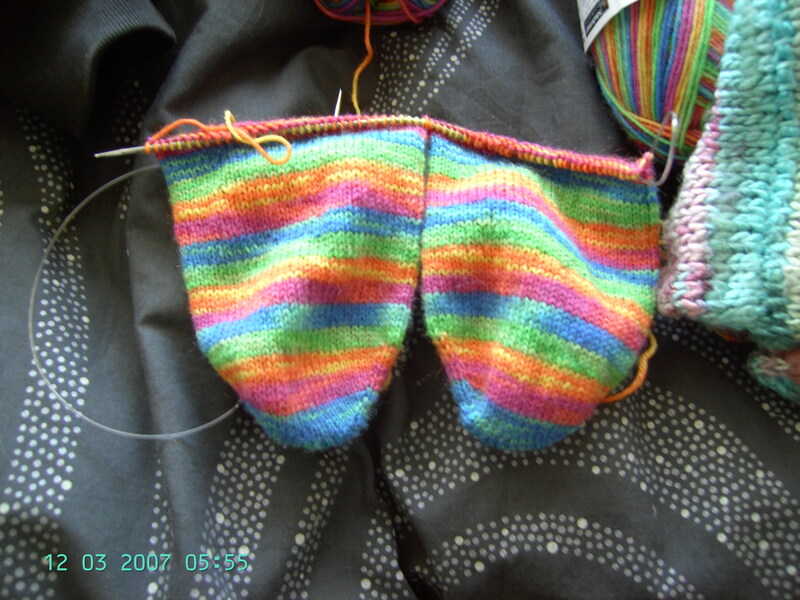 Naturally, I’ve already started another pair, which are probably going to be exclusively knitted on trains- I’m going to be travelling around a bit in the next few weeks, and I’ve been to Manchester yesterday for a conference. Very interesting. 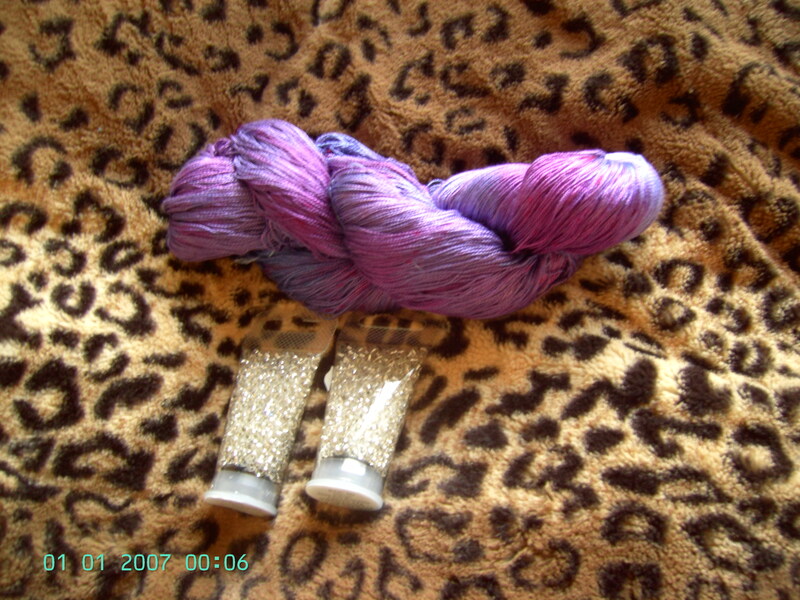 I’ve also started (ad nearly finished) a shawl- Glitz at the Ritz. 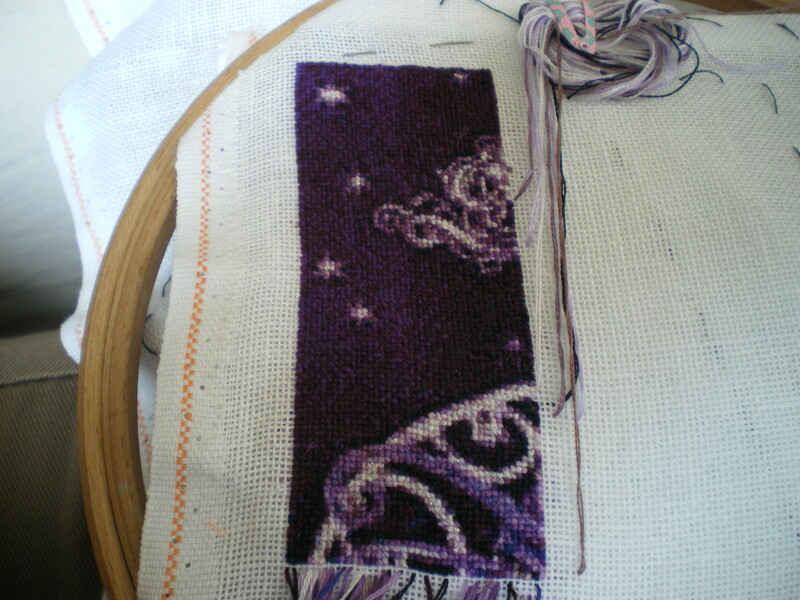 I’m doing it in a nice purple colour, with silver beads. 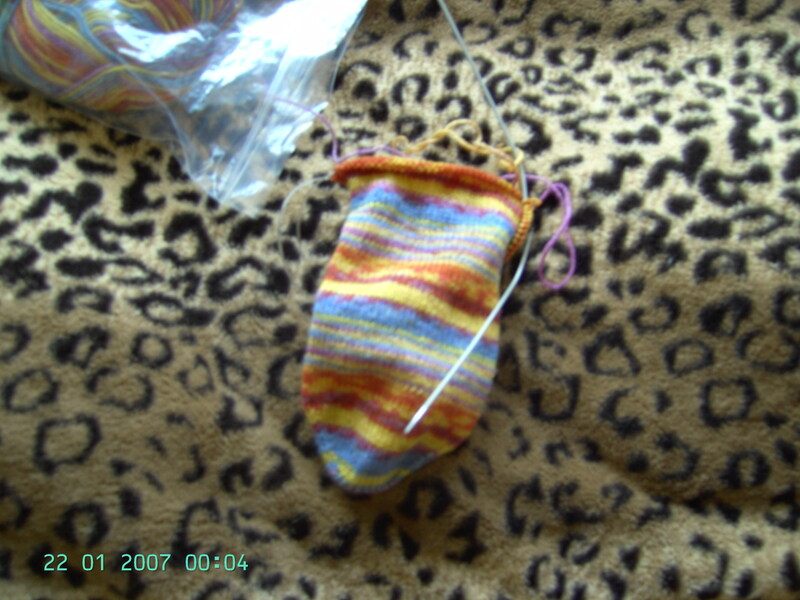 It’s gotten so big that there isn’t any point me showing you a picture- all it look like is a puddle of knitting! 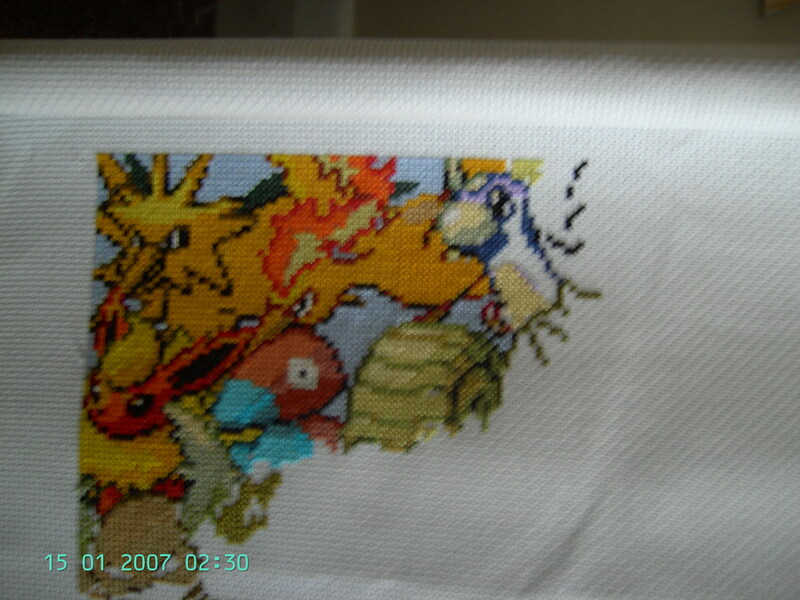 I can’t wait to finish this and see what it looks like properly! 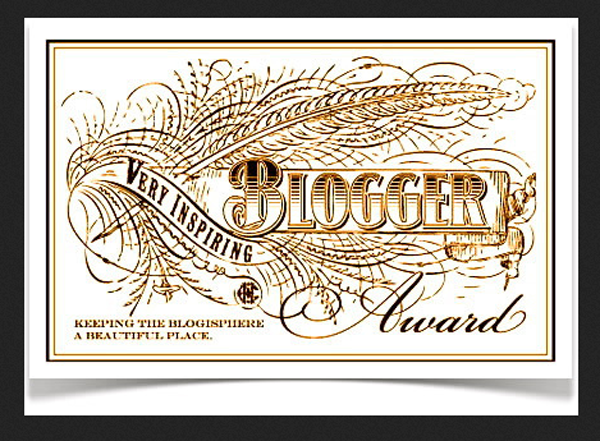 So, as part of her Spring Blog Hop, *Wisher*, over at Pretty little things in a box held a giveaway. And I’m massively chuffed to have won one of the prizes! So, I now have some lovely post to look forward to. 🙂 Isn’t looking forward to post (other than bills, obviously!) such wonderful fun? 🙂 The timing couldn’t’ve been better either- it’s been a very hectic couple of weeks at Uni, and I was getting very worn down, but now I’m raring to go again. 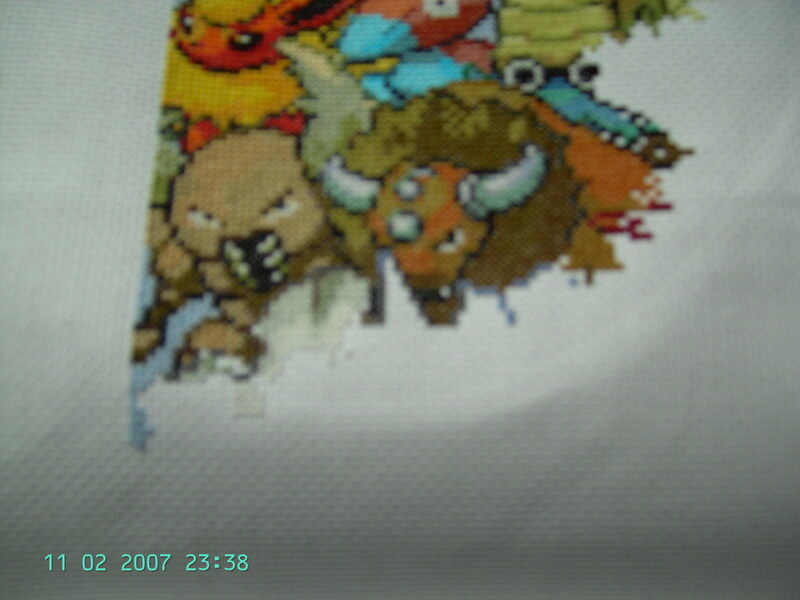 So, I managed to finish April’s block, and even got some of the border done, before going back to pokemon for a bit! 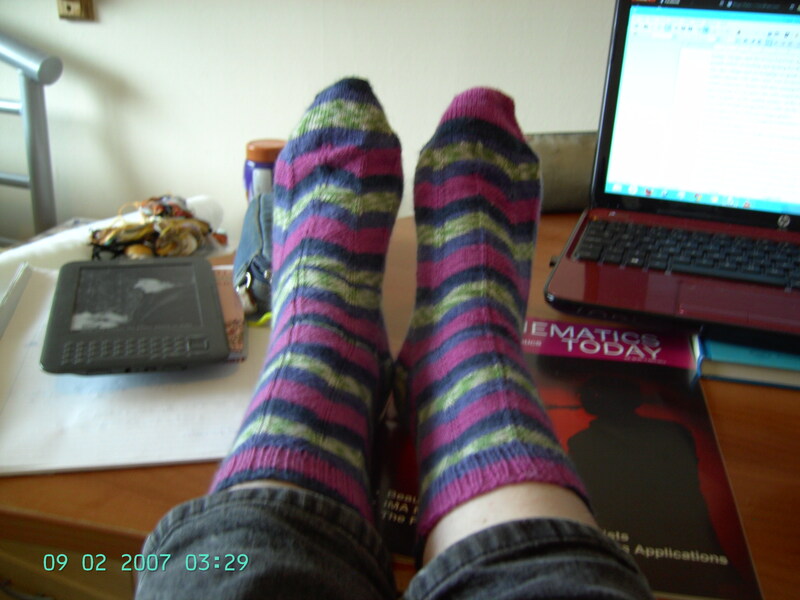 And, of course, I have to have a pair of socks going on! 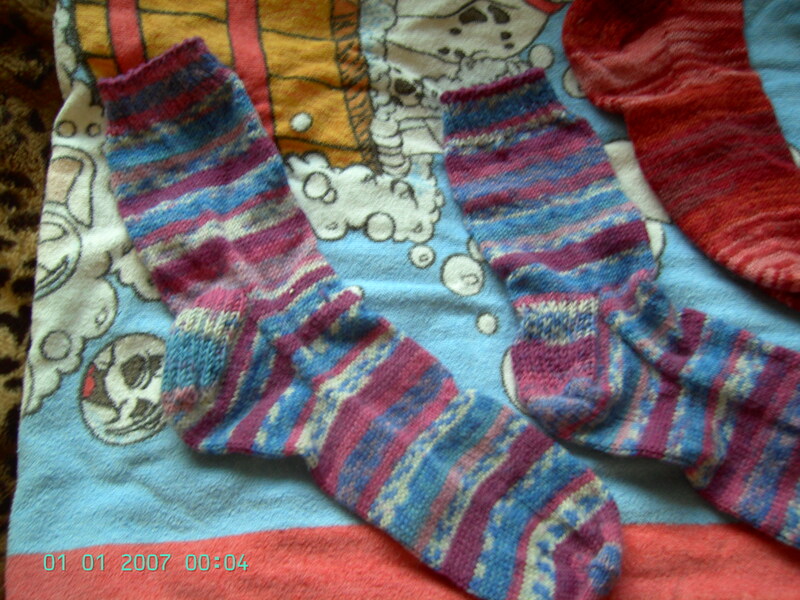 This pair is destined to be as matchy-matchy as a pair of socks can be, short of actually using a plain colour! So, naturally, they have to be done two-at-a-time. It’s been a while since I’ve done a pair like this, it really does feel like they’re going quicker! 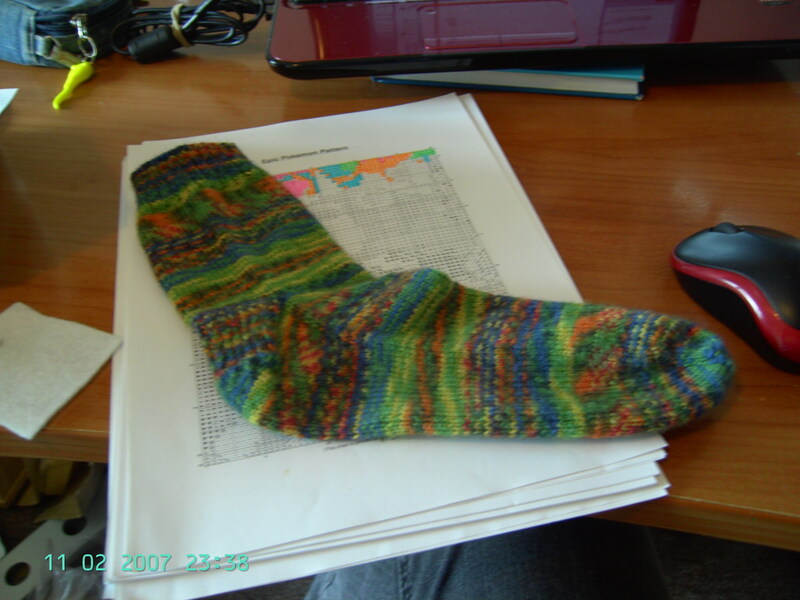 But, now it is May, and I just realised I have about 4 weeks to finish my dad’s birthday presents… I need to finish a pair of mittens, and design and stitch a birthday card. This is going to be fun! At least after next week, my workload at Uni will reduce lots! You know, it’s fairly bad when the first time you realise it’s April is when you get the next part of a SAL in your inbox. Especially when you haven’t finished January’s part! Oops! Better get stitching, I guess. Such a hardship, but I suppose someone has to do it. So what crafting things have you all been up to? 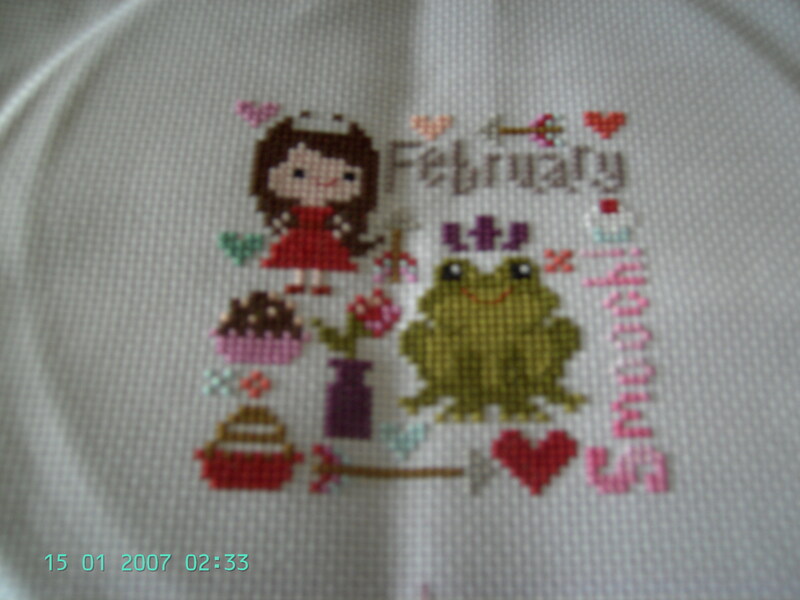 Cross stitching, cross stitching and more cross stitching! So, I haven’t done any more cards- although it is on my radar, so it should happen at some time… hopefully this century! 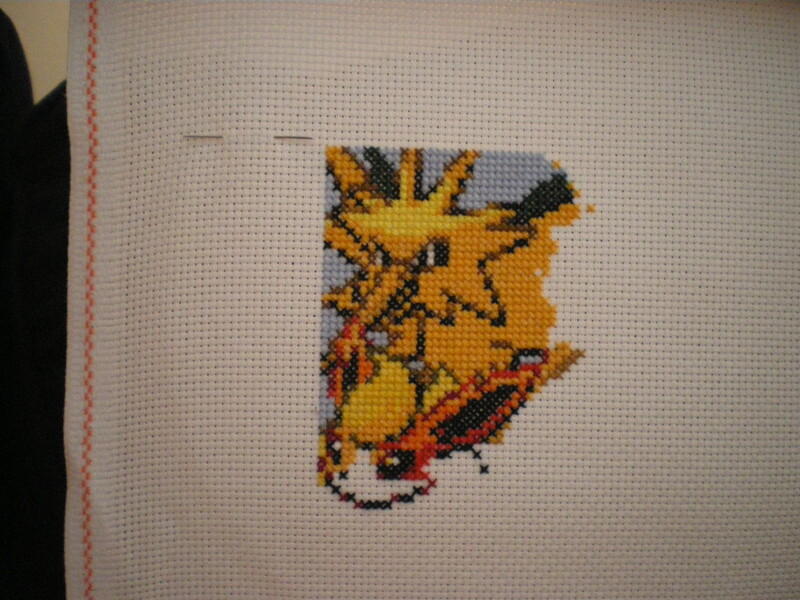 But I was buzzed by the feeling of finishing something so quickly, so I decided to race for a page finish on the pokemon cross stitch- and I made it last night! I had just been moving (slowly!) across the top half-page really, which I will probably go back to doing when I carry on with it. It’s going away for a while now, so I can concentrate (and maybe catch up?) 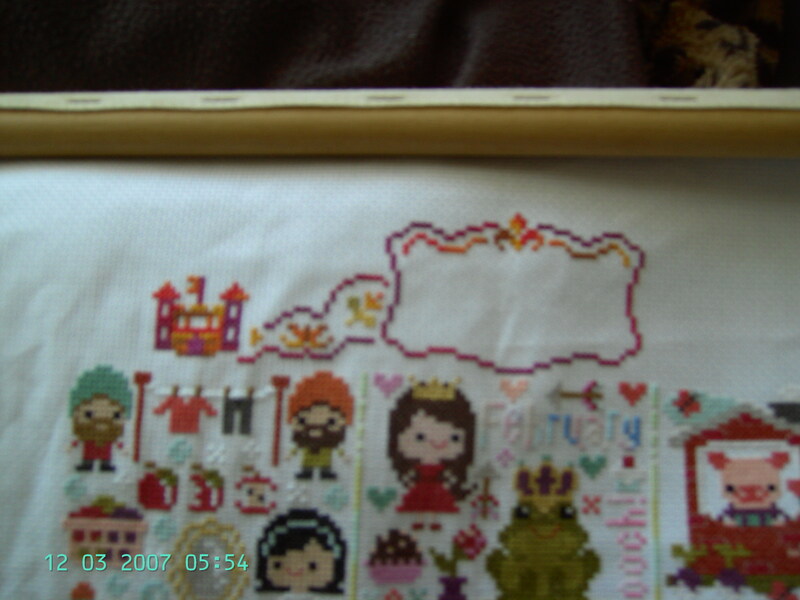 on the Once Upon a Time sampler. I’ve started March. Although, now I remember that I was going to make some more cards, it may get side-tracked for that. But hey, as long as I’m doing something crafty, I’m happy! 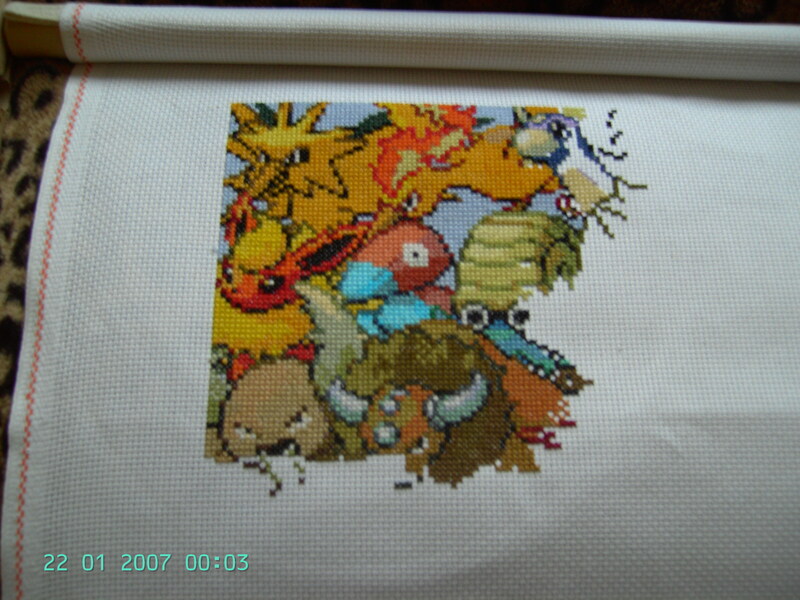 I’ve also done some stitching of stitching. I didn’t do all of this lately! 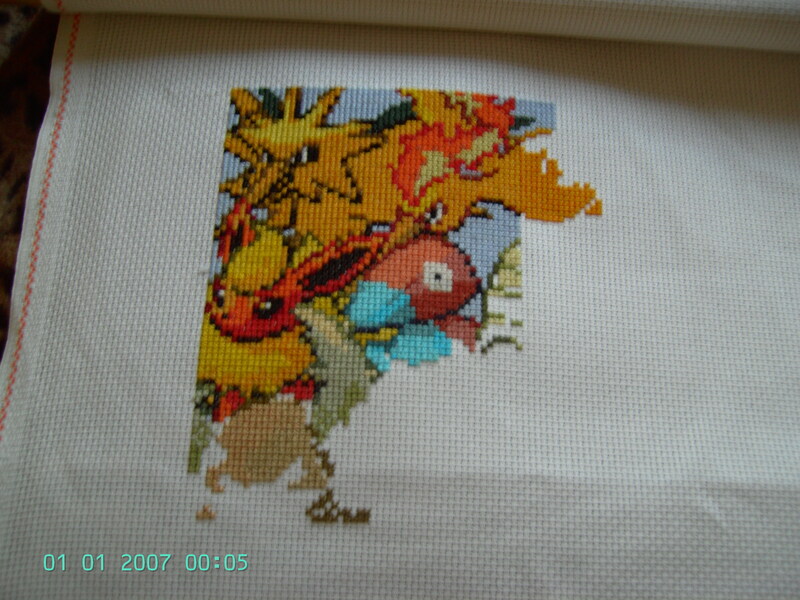 But here is where it stands now, and I’m hoping to get lots of this done 🙂 It’s a very easy stitch- lots of blocks of colour! Why is there not enough time in a day to do everything? Especially with all the useful things everyone has to do, like work! Well guys, after a (very) long hiatus, I’m back and raring to go. 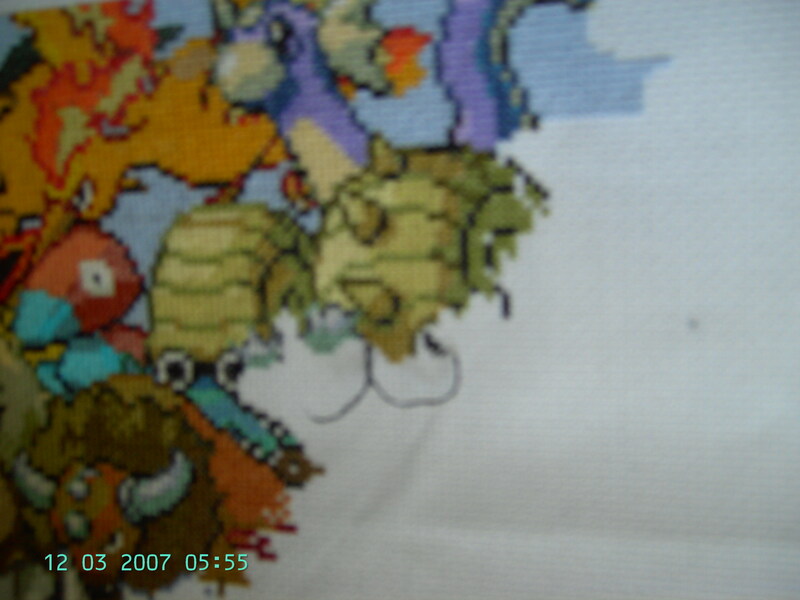 I haven’t exactly been idle on the crafting front either, even if most of my time was taken up with my (successful! yay!) application to York. So this September/October I will be moving all my things from Plymouth to York to start studying for a PhD in pure mathematics. Go me! They don’t quite match, but I really prefer them this way. 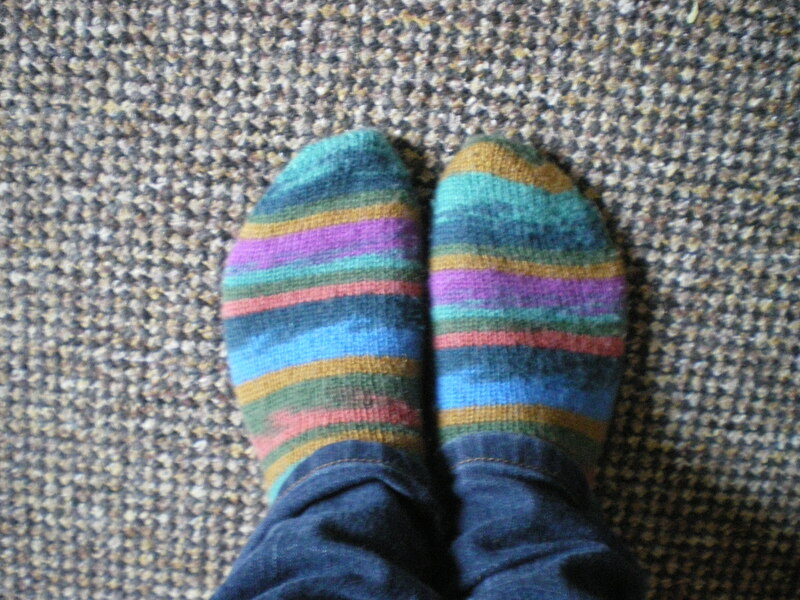 Not to say I don’t like my perfectly matching patterned socks, but the not-quite-matching-ness takes away from the fact they are so, well, boring. I don’t like boring yarns, and evidently I don’t like boring patterns. 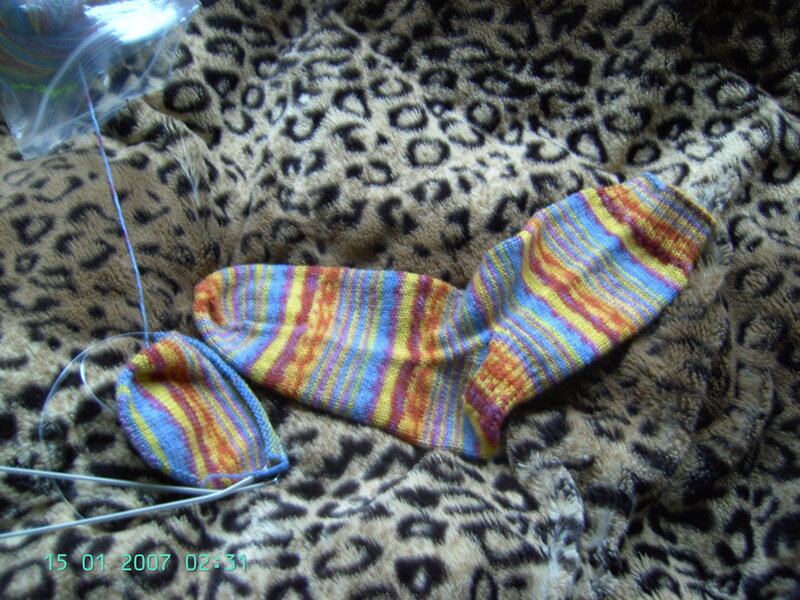 But colourful yarns in exotic patterns really don’t work. *sighs*. 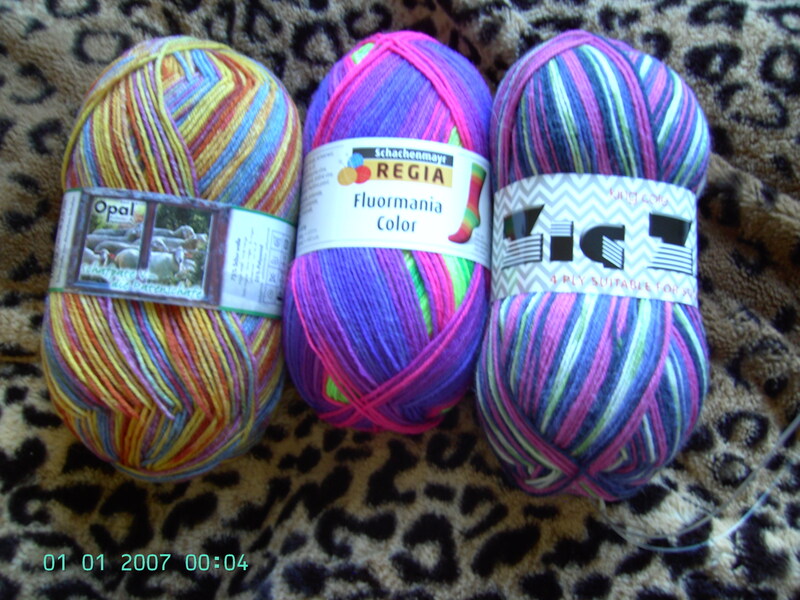 Anyone got any patterns which do work with stripy yarns? 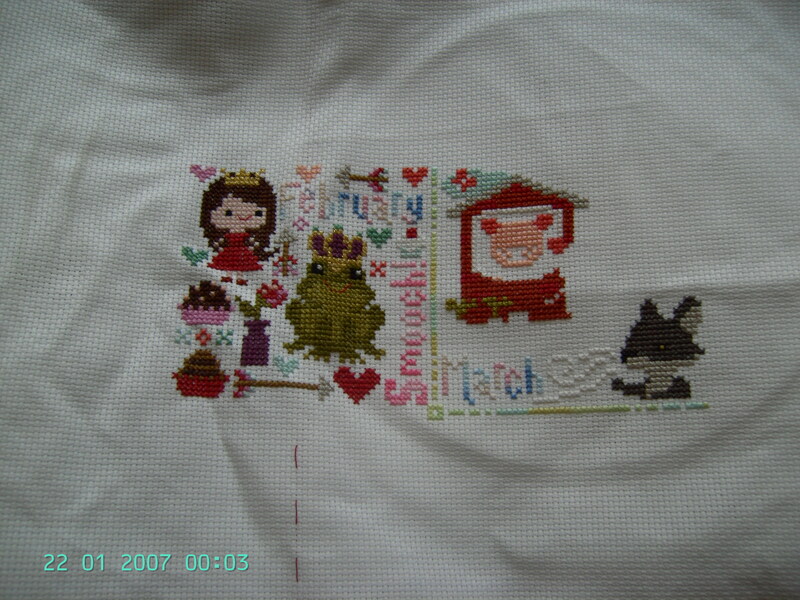 I’ve also been cross stitching a lot, firstly there’s Spirit, which has now gone over half a page!!! What I think it’s amazing about this pattern is that the S for Spirit takes up more space than the rest of the word! One more column puts me half-way, and the S is pretty much done there, with just the beginning of the p, and there’s more blank space on the right of Spirit than there is on the left! Pretty awesome, huh? So far it’s very yellow! That should stop soon, but after that red/yellow one underneath the first yellow one, I’m going sideways and doing a (yep, you guessed it!) yellow flaming bird! Ahh well, after that it gets a bit more interesting. Well, now this has finally been written, I can get back to my crafting! Got to squeeze as much in as possible before October, when I start ay York! Squeeee!